What can I say, I've been a Superman fan ever since I was kid. Who hasn't donned the towel around his neck and jumped off the back of a couch, bed, roof, etc? Superman is, well super, and because he's so, ahem, Super, what can you throw at him? Not much. 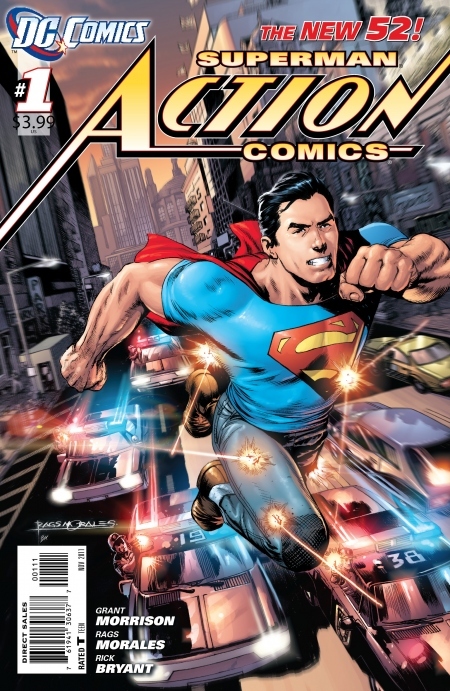 So now we have the New 52, and Action Comics #1 which delivers a new launch to a character that has needed an image makeover for a very long time. The story begins five years before Superman dons the new and improved outfit featuring the non-tighty reddies over his tights. He looks less super and I think he'd look fine without the ½ cut cape, but what do I know? I don't want get to caught up in the terrible use of a cape, but lets get down to the story. So in the opening scene, we have Superman swooping in on a mob party, they all pull their guns, and Superman says a cooky line about rats, and the cops show up. The cops get up to the penthouse and find Superman, with a Mr. Glenmorgan who apparently is very wealthy, and very connected being held over Supes head ready to drop him. Superman exclaims, “I'm Superman! And I don't like people who break the law!” OK he really didn't say it like that, but do you really want me to ruin everything for you? After violating Mr. Glenmorgan's civil rights, Superman is shot at by the cops. He catches a bullet, does his best John Travolta impression, and sprints away while the cops are after him shooting their AR-15's. A pursuit ensues and it becomes clear Superman, at least this one, cannot fly. While certain laws of physics are being broken, others are remaining in tact, at least when Superman helps some people from a building being demolished by a huge wrecking ball and some tanks. The tanks are apparently commissioned by General Lane, and a his “consultant” Mr Lex (I look like an egg-head) Luthor. A couple other things happen and just when you think the military has Superman, the people in the building come to his rescue and allow him to escape, via some super awesome Hulk smash jumping! After that, Supes goes home. Wearing his best Chuck Taylor’s, Supes is definitely busted up, showing he's truly not invincible. Superman then calls his good ol' pal, Jimmy Olsen. This is where we find out that Jimmy Olsen and Clark actually are great friends, and Jimmy is back to being Lois Lane's camera boy, but here's the kicker, they work at different papers. My opinion? It should be interesting to see how this Superman, becomes the Superman we see in JLA 1. I for one, was not blown away by the comic, but because I love Superman then I want to see more. .
Bret Kinsey is a contributing writer at Champion City Comics. In his spare time, he is a ninja assassin.